Get a handful of plum halves (preferably the fresh ones but we’re using the fruit preserves version since we can’t grow them here in the Philippines) and toss them in a tall glass of velvety smooth milkshake topped with heavenly vanilla ice cream deliciousness to have a little idea of how Victoria’s Secret Beauty Rush Body Double Mist and Body Drink Lotion in Plumdrop most probably tastes… errr… smells like. I must say it’s quite close but what I’m sure about is that Plumdrop holds a very unique scent. It’s fresh and clean without being too citrus-y. The creaminess of its fragrance is sweet but not sickeningly sugary. IMO, spraying this a lot on your body will not offend sensitive noses around – that’s how soft it gets. Most Beauty Rush aficionados would agree that the lasting power of their favorite Victoria’s Secret scent line is weak – about 2-3 hours alone and about 3-4 hours if you will layer them on with their body drink lotion counterparts. You may want to skip this if you want your body cologne/spray to last the whole day right after wearing them in the morning before heading to work or school. Everything seems to be in balance here. The scent doesn’t seem to change from the moment you smell it from the bottle and until it dries down on the skin which is great. I’m about to run out of this in a month or so and I would definitely repurchase. 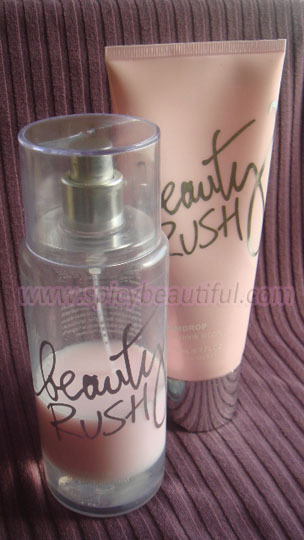 I love all of the Beauty Rush sprays! Plumdrop is such a soft, sweet scent perfect any day of the week! Thanks for dropping by Sugarsheen! The Beauty Rush line is my comfort scent.